In high school, Michael Crider was the jokester, the drummer in a band, the Howie Mandel impersonator. Fast-forward ten years and the funny man has married and become the family man. The Guy's Guide to Surviving Pregnancy, Childbirth, and the First Year of Fatherhood ,Crider's candid, down-to-earth account of his transformation,proves that even without much sleep, he has kept his sense of humour completely intact.From the moment he hears the unexpected news that the pregnancy test is positive to the end of his son's first year of life, Michael Crider is awed, anxious, and all-too-human. In between these milestones, he endures the aches and pains of his wife's pregnancy (which had a clear impact on his own bodily comfort), swallows his pride when bunny wallpaper replaces his beloved Budweiser mirror, has a short and only partially-appreciated stint as her labour coach on the Big Day, and experiences every one of his son's firsts" as though they were his own. 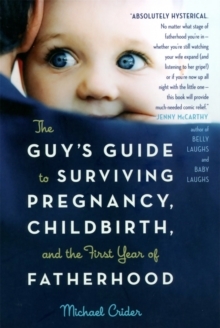 Honest, informative, hilarious, and heartwarming, The Guy's Guide to Surviving Pregnancy, Childbirth, and the First Year of Fatherhood is a must-read for all new parents.